Wladimir Klitschko has called for Tyson Fury to be stripped of his titles and suspended, comparing the heavyweight champion to Adolf Hitler – but the ‘Gypsy King’ didn't hesitate to hit back. Klitschko blasted Fury ahead of their clash at the Manchester Arena on July 9, calling him an "imbecile champion." The Ukrainian says Fury's controversial comments about women, homosexuality and the Jewish faith have no place in the sport. "We cannot have a champion like that," said Klitschko. "Either he needs to be shut up or shut down in the ring, or just suspended, because you cannot create more hate. "Friction creates friction, the more hate you bring out there - with women, the gay community and Jewish people - what next is he going to say? "It's just something we don't need in this world, it's beyond boxing. I'm totally not on the same page as him." Fury has come in for severe criticism for increasingly strange outbursts since being crowned world champion. In a YouTube video posted earlier this month, he said: "Everyone just do what you can, listen to the government follow everybody like sheep, be brainwashed by all the Zionist, Jewish people who own all the banks, all the papers all the TV stations. Be brainwashed by them all." 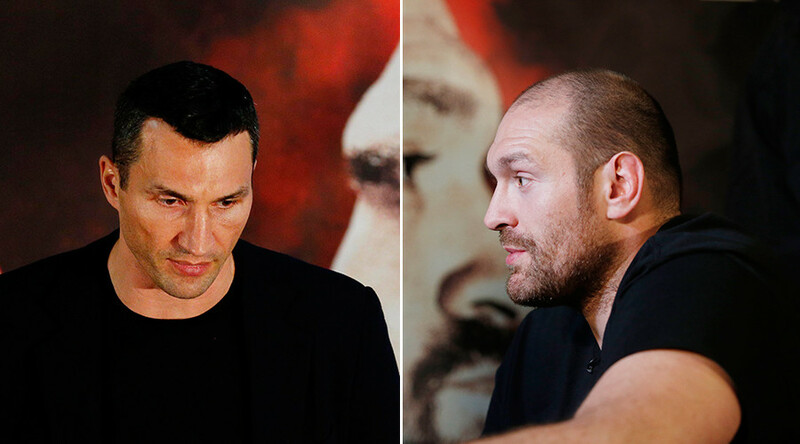 Klitschko added: "I'm fighting a guy who can't hold his mouth on certain things. "I was in shock at his statements about women, the gay community and when he got to the Jewish people he sounded like Hitler. The man is an imbecile. Seriously. "You cannot put it all together as a representation of the sport of boxing. He's an imbecile champion. "It puts the world of boxing in the wrong spot. He represents not just himself, but the sanctioning bodies, a lot [of] boxing fans in general, it's not just about him and he needs to understand, but he obviously doesn't. "All the stupidity that comes out of his mouth. Especially in this crazy world when we can see all that's going on, we don't need someone having this stage and bringing hate to Jewish people, I can't accept. "As I said, he sounds like Hitler, I cannot accept it and I don't accept. The man is probably mentally sick. "It's not just British fans I'll be doing a favor when I beat him, it'll be for Klitschko fans and boxing fans in general." Fury has subsequently hit back at Klitschko, saying the Ukrainian has "no education on the matter." "He doesn't realize Hitler killed hundreds of thousands of gypsies, if not millions," he said. "To call me that, Wladimir, is [a] very, very, very bad insult friend. "Because a lot of my ancestors were killed and murdered and brutally mass murdered by Hitler. "For you to call me that is a very bad insult and let's not forget that your people, the Ukrainians, were the guards of the death camps where my people were slaughtered." Fury ended the video with a string of expletives. The pair met last November where Fury ended Klitschko's near 10-year reign as champion after a unanimous points decision. The British boxer's style bamboozled Klitschko in the first meeting, but the Ukrainian fighter is expected to put up a better showing in their second bout.